French curator and artist Isabelle Arvers will be visiting the UCLA Game Lab for a 2 day hands-on Machinima workshop. The two day workshop will begin with a presentation of machinima and game art, looking at a variety of common approaches from fan fiction to more experimental art. Following the presentation, we will explore hands-on the software tools for creating our own machinima. Isabelle Arvers is an new media art curator based in Marseilles, France. Since 2002 she has been curating Machinima and other new media programs for festivals and museums including at The Centre Pompidou, Paris, The Vector Game Art Festival, Toronto, Vancouver Art Gallery, Vancouver, and The French Cultural Institute, Berlin. Last year, Isabelle was part of the curatorial team of the 2015 UCLA Game Art Festival at the Hammer Museum. She has also taught courses and workshops on Machinima at various institutions including The Center for Digital Media in Vancouver and at the Sorbonne in Paris. The workshop starts on Monday November 7, at 5pm. See the schedule below. 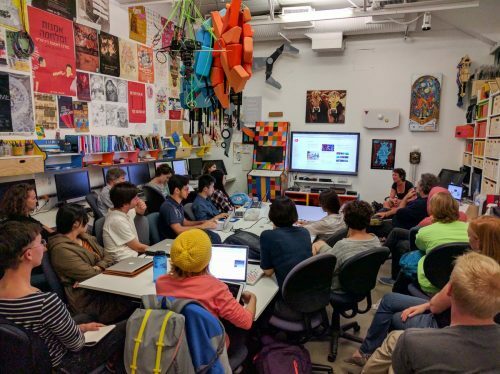 5pm-8pm: Introduction to Machinima, Game Art, the use and history of game culture in contemporary art; and learning how to create your own Machinima. 9am-Midnight: Work Session and one-on-one check-in with Isabelle, and in progress crit in the lab (TBD exact times) ; *Pizza will be provided **We understand that people will have other obligations this day such as class or TA duties, and voting. The expectation is that you use this day to work in the lab at your convenience and Isabelle and Tyler will be there to help. This workshop Is co-sponsored by the French Consulate in Los Angeles.